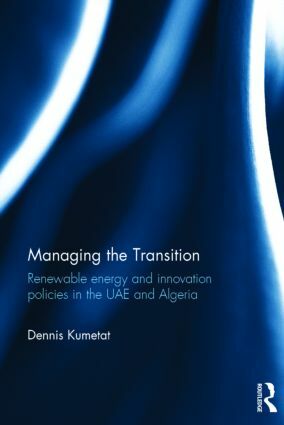 With a focus on the UAE and Algeria – who were both vocal in their promotion of renewable energies for domestic and export-oriented power production – these two cases studies are highlighted with common features both in terms of policies and energy systems and showing the vast differences between the governance contexts of the lower Gulf and of North Africa. Both country case studies also feature sections on the most visible renewable energy project connected to the country – the UAE’s Masdar project and Algeria’s energy efforts and relation to the trans-Mediterranean renewable energy efforts around the Desertec project. Building on original research in both countries and over 90 interviews with senior stakeholders in half a dozen states, this book seeks to contribute to both Middle Eastern and (renewable) energy policy studies. In combination with the transition management approach as innovation theory model this book covers a timely and important topic with a wide-ranging audience, both geographically and in terms of scientific background. Dennis Kumetat studied in Cologne, Bonn and Beirut and received a doctorate in Environmental Policy and Development at the London School of Economics and Political Sciences, UK. He has authored several articles and research publications in the fields of Middle Eastern history, politics, renewable energy and climate change. In 2011, he joined the German Foreign Service.